A Sandbox lets you create your own personal workspace, your own version where you can enter & store data-value-changes without impacting the base (actual) data. A sandbox is not a copy of the base data, but a separate overlay or a layer of your own data values that you have entered on top of the base data. Sandboxed data is your own personal work area, its private to each user and cannot be seen by others. Once a sandbox is created, user can run multiple iterations on the data set without effecting the base data. When user commits the sandboxed data back into the base data, the changed values are then visible to others. Sandbox help user explore different business scenarios, for example, user may create best case, average case, worst case. While “sandboxing” has been around for some while now, users have been asking (almost demanding) for a “Compare Sandbox” feature. This in essence is the possibility of comparing different scenarios (like best vs average vs worst) to help users analyse and drive better business decisions. This would also help streamline scenarios well before they are committed in the system. 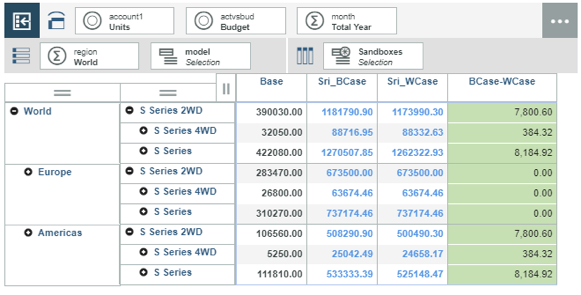 As we now know, earlier versions of Planning Analytics (TM1) did not have an option where in users could compare different sandboxes, Now, users with entitlements to Planning Analytics Workspace (PAW) licenses can not only create personal scenarios in sandboxes but also view them side-by-side to compare and analyse the cause & its effect. This was made possible as PAW considers Sandbox names as elements of dimension called Sandboxes (refer fig 1). For illustration, you can now display your Best & Worst case sandbox scenarios next to each other in nested columns, and then, calculate the variance, as shown below. In this example, we have two sandboxes Sri_BCase and Sri_WCase. In Figure 2 Sandboxes are same as base data. BCase-WCase is on-fly calculation which gives variance between Sri_BCase and Sri_WCase. 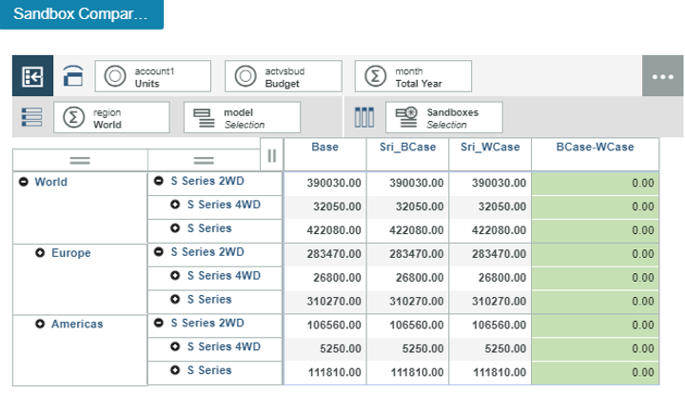 In Figure 3 Sandbox Sri_BCase, budgeted Units for S Series 2WD for world has been increased by 3%, Sri_WCase still holds base data. We can now see variance between Sandboxes in below figure. 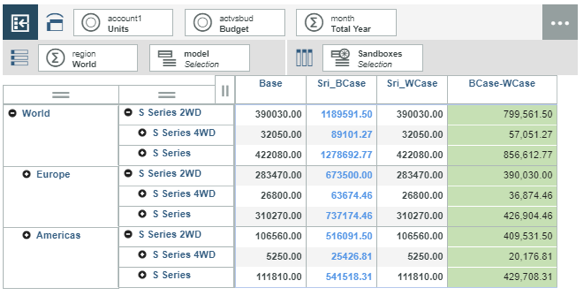 In Figure 4 Sandbox Sri_WCase, budgeted Units for S Series 2WD for world has been increased by 0.5%, Sri_BCase holds 5% increased data earlier. We can now see variance between Sandboxes. In Figure 5 this data can also be visualized using different graphs with in PAW. In this case Stack Bar has been used to Visualise data. In Figure 6, we can also visualise the impact of these changes on other values like Sales, Price and other related measures. Capability to spread data across multiple sandboxes. Capability to add members (new versions) to the Sandboxes dimension unlike the traditional way. As a part of its continuous improvement program, IBM basis its Client's business requirement and requests has been adding features to PA Workspace. 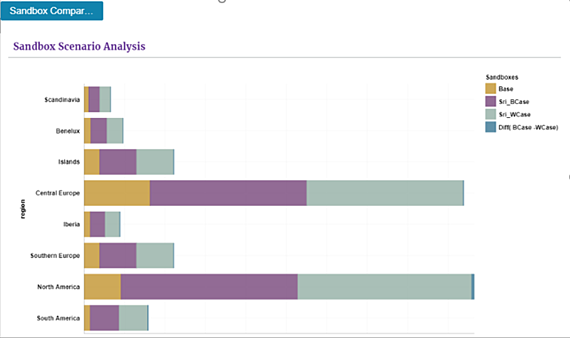 IBM published "Compare Sandboxes" feature in PA Workspace in its version 2.0.31 release. Some of the features from earlier versions are Create Virtual Dimensions on fly, Calculation on the fly, Sorting, Ranking etc. Hope you would have enjoyed reading this blog as much as I had testing this cool feature; stay tuned for upcoming blogs. You may also like reading “ What is IBM Planning Analytics Local ” , “IBM TM1 10.2 vs IBM Planning Analytics”, “Little known TM1 Feature - Ad hoc Consolidations”, “IBM PA Workspace Installation & Benefits for Windows 2016”. For more Information: To check on your existing Planning Analytics (TM1) entitlements and understand how to upgrade to Planning Analytics Workspace (PAW) reach out to us at info@octanesolutions.com.au for further assistance. Octane Software Solutions Pty Ltd is an IBM Registered Business Partner specialising in Corporate Performance Management and Business Intelligence. We provide our clients advice on best practices and help scale up applications to optimise their return on investment. Our key services include Consulting, Delivery, Support and Training.